How long have you been producing paleo-art? After cars and airplanes, I was drawing dinosaurs when I was just a few years old–a consequence of a dinosaur craze during the 1950’s. Not until 1977, when I was 28 and living in Montana, did I begin a self-taught effort to refine drawing and develop some sense of composition. I spent years drawing in the field–mostly simple sketches of trees, rivers, mountains, etc. and did early finished work. Dinosaurs walked into some of the images from time to time and I followed a few artistic interests that indirectly prepared me to do paleo-art. A good, long time went by before I could point to what I did as anything looking like legitimate employment and a career. I count books and TV as the first major influence, although there were also comic strips (Terry and the Pirates, I think), wax models and museum visits to the Smithsonian. The very first book I pulled down off a elementary school library shelf was titled So Long Ago–I remember looking up and seeing the title well over my head. 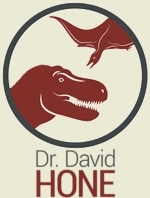 It was a whimsical romp through early Earth History, specifically arranging the proper animals together in the proper time–and may have instilled a sort of prime directive I’ve followed ever after. An interest in art seem to develop over time, especially after I found various books about landscape painters from the 19th Century. The finished work of artists like Frederick Church, William Turner and Thomas Moran was a very high star to reach toward, but their preliminary drawing and field sketches inspired me to try my own hand at working in a sequence from simple to more complex images. Going outside and taking the time to look at things in order to put them on paper was probably the most essential part of my becoming an artist and developing an approach to finished work. Field sketches gave me a better informed imagination. What is your favorite piece of paleo-art that you have produced? I don’t really think of favorite pieces, I’m actually pleased with a lot of my work–especially if a set of images work together to tell a paleontological tale. Some of the Two Medicine work still looks good to me. 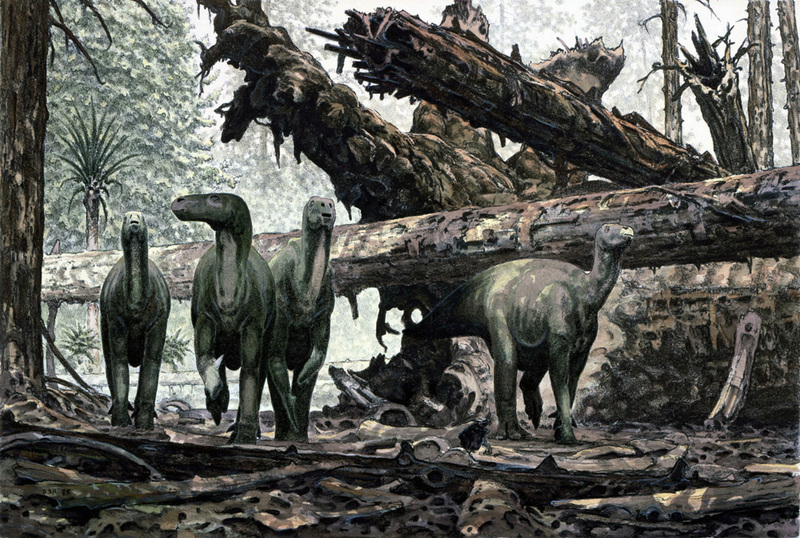 And a lot of the Triassic work I did for Petrified Forest. With time and new discoveries, some of this work preserves old, abandoned ideas, though. All the little dinosaurs in illustrations I did years ago ought probably to have feathers. 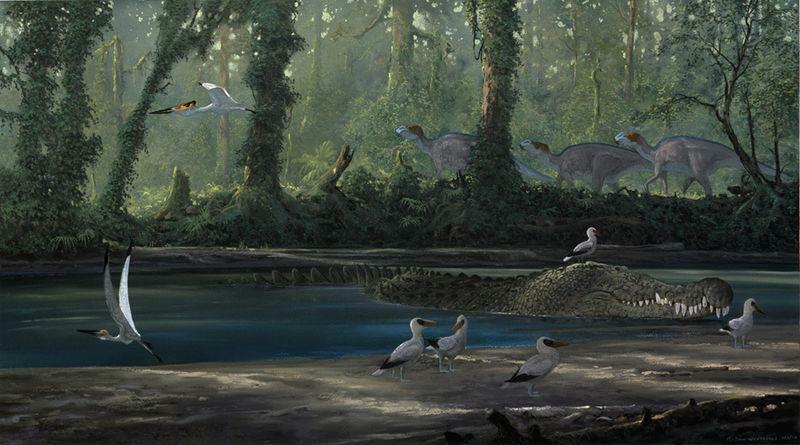 Who is your favorite paleo-artist or piece of paleo-art? I think Charles Knight’s work played a part in my introduction to realistic dinosaur reconstruction. And Zdenek Burian, the Czech illustrator. 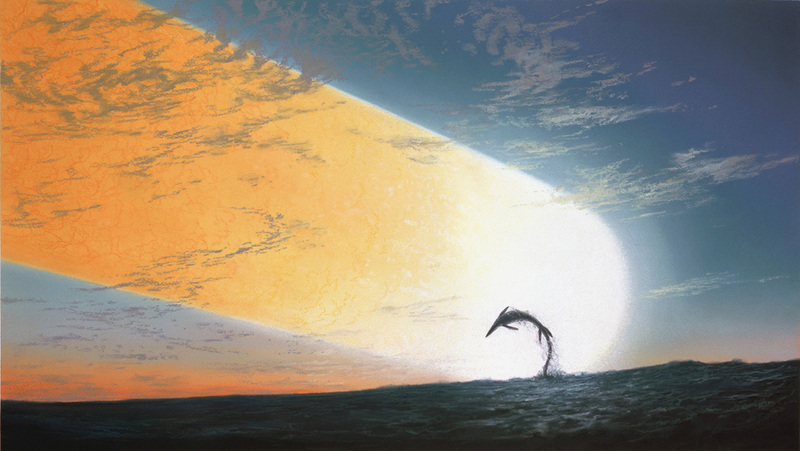 Perhaps my favorite paleo-art, though, was the cover of some Classic Comic version of Journey to the Center of the Earth, the image of fighting marine reptiles. And also the stop-action animation from the 1933 movie King Kong, when Kong fights a T-rex (in lovely settings of a wild, primordial forest). I don’t seem to have favorite animals, though I seem to especially like marine reptiles. I have favorite approaches to reconstructing about anything, though the less I know about some new animal or setting, the more work it is to get up to speed. I have to say, that I think dinosaurs have come too much to represent Earth History and paleo-art is a broader venue than just showing dinosaurs doing this and that. I see lots of things going neglected, including geologic stories dominated more by physics, climate, landscape and other forms of early life. But what gets done most often is what people want, or what publishers think people will buy. To really do original work, you have to be independently wealthy enough to put money concerns aside or find supporters prepared to give you long spans of time. This happens sometimes, but not often enough for me. I recently did some Pleistocene mammal drawings and can see there is a lot more to do with that subject. 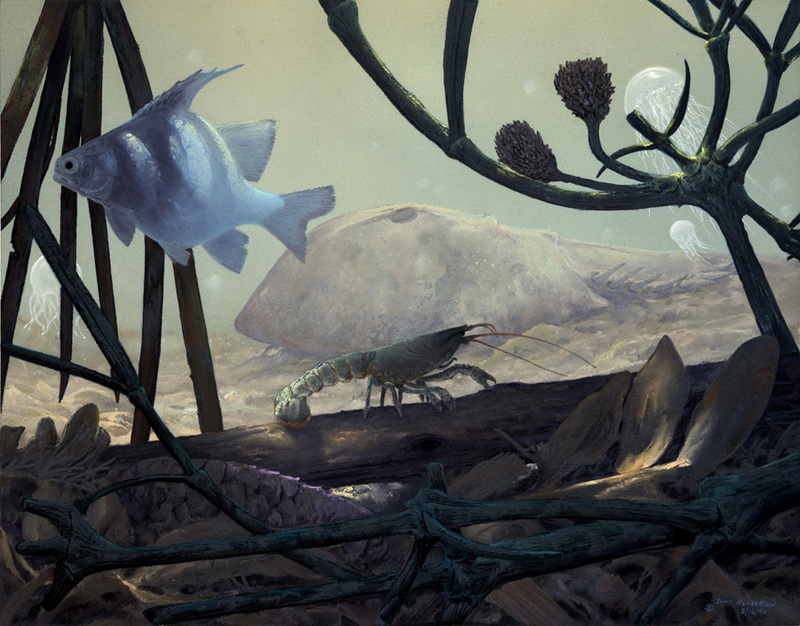 The early Paleozoic looks to be rarely treated in paleo-art. Burian did lots of such images and I see lots of things yet to do. What do you think is the most important part of good paleo-art? Every artist is going a find a different solution to the same task. For me, I want to see an illustration as representing a place, large or small. If you can play with light (and color), compose original scenes and poises and well present data new and old together, that’s an end to reach toward. It’s interesting that Doug mentions his appreciation for the 19th century landscape painters, as I think his creative use of lighting is what makes his work stand out. 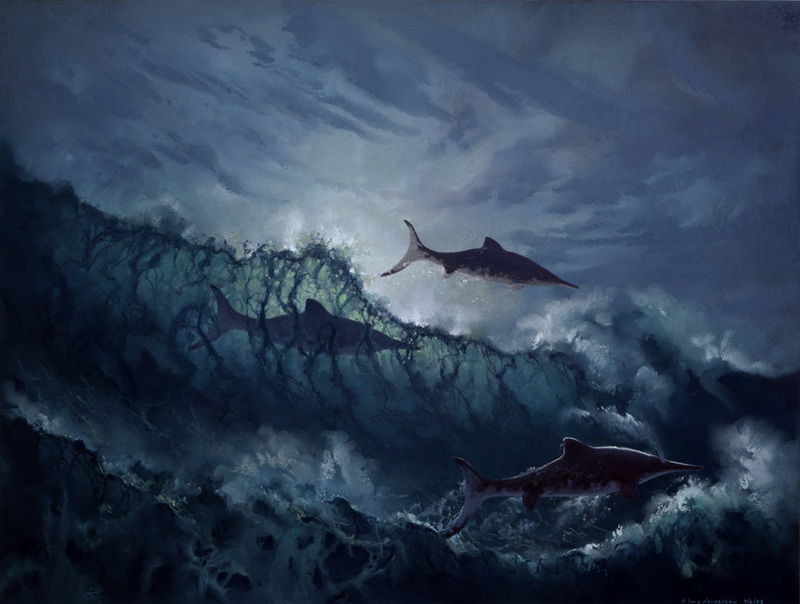 Maybe go even further—plesiosaur battle in the style of a stormy Turner seascape? This is great, thanks Dave, really liked it! Doug is also my favorite paleo artist from the last quarter century, really since Knight and Burian. Doug’s not an illustrator, but a true artist, and the relative lack of imitators as compared to someone like Greg Paul or Mark Hallett is indicative of how special his work is. WOO-HOO! Thank you for this interview. I love the art of Doug Henderson and I am so glad to see he has a eBay store. Doug Henderson, if you are reading this, I really love your work. It is wonderful and diverse. Thanks for making such beautiful things. 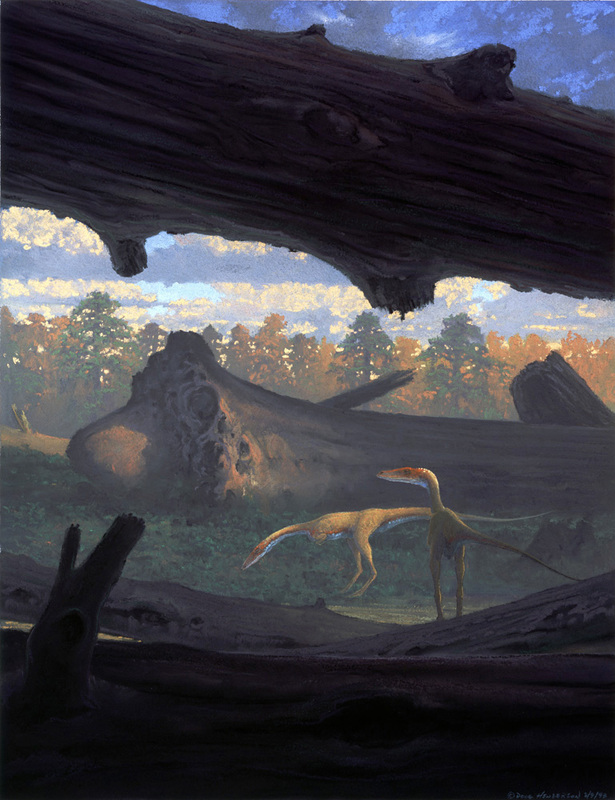 Doug Henderson is definitely one of my favorite paleoartists. I do have one question: why are the Malta duckbill’s front limbs so skinny? 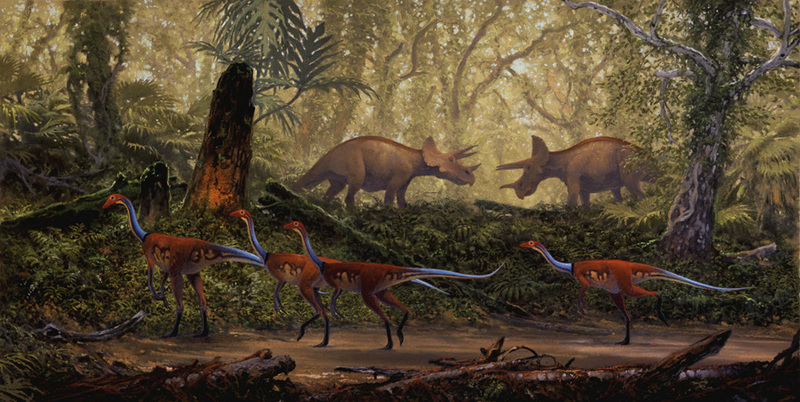 This seems to be a trend in ‘modern’ paleoart; make the poor creatures’ limbs so thin, they cannot have even supported themselves, never mind walked or ran or recovered from a stumble or fought for their lives. No matter how much weight the limb bones could support–and I do not care if it was INFINITE–virtually no muscles means no movement. Limbs in restored animals often are thinner than the bones alone, as in DH’s Malta Duckbills. Many of Dave Hone’s blog followers seem to be sticklers for accuracy, so how can this trend pass without comment? Take a close look at the front limbs of ungulates, especially large deer like elk or moose. They really don’t have any bulging muscles below the elbow. Because of the mechanics of their joints, the shoulder and upper arm muscles do the bulk of the work, swinging the limbs forward and pushing them back. Inertia as the tibia and fibula swing forward causes the virtually unmuscled metacarpals to swing forward as well, while the joint design locks them and keeps them from hyper-extending. So long as the bones are strong, its easy to carry quite a bit of weight this way. I suspect most of the heavy lifting in duckbills –as far as propulsion is concerned — was provided by the rear limbs, with the front legs supplementing to keep the front of the body clear of the ground. 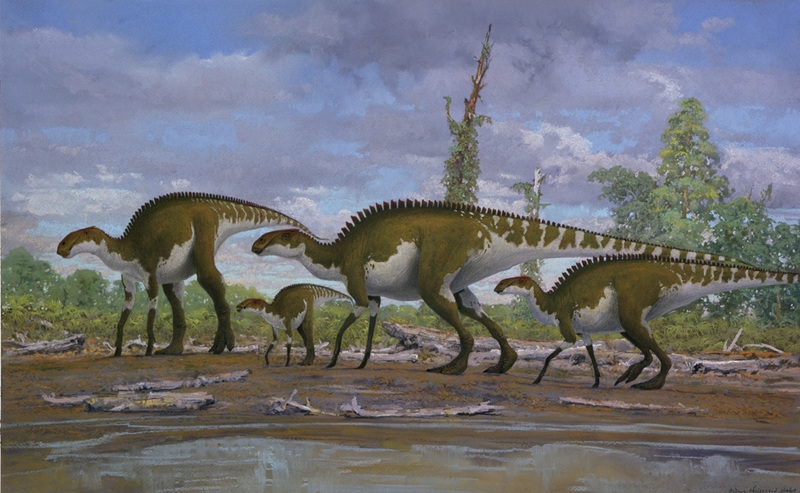 In fact, the humerus in Doug Henderson’s rendering correctly seems to have quite a bit of muscle, allowing it to swing the forelimb forward where it locks and props up the body as the hadrosaur moves. You are perfectly correct about the lower limbs of ungulates. Never mind ungulates, how many terrestrial tetrapods have fatter (muscular) lower limbs? No erect limbed four legger has fatter lower limbs that I know of, including dogs, wolves, cats BIG cats, bears, you name them, the lower limbs are slender under all that fur. Elephants, hippos, rhinos also have fairly slender lower limbs. Lizards and crocodilians throw the equation off, until we see that they are basically splay legged. Birds? They’re bipedal and cursorial. Slender lower legs for every bird I can think of that walks on the ground even partially, from kiwis to ostriches to secretary birds to gallinaceous birds and even passerine birds. So far, so good. As erect limbed animals, I expect dinosaurs to have fairly slender lower limbs to very slender in the troodontids and so on. Duckbills fit the bill too (pun on purpose!) so where does that leave my contention that Doug’s Malta Duckbills front limbs are too thin? Same place. Sorry! Not even chameleons have limbs that thin in proportion to the body. Sorry! The forearms, as drawn are thinner than the bones. WAY thinner than the bones. Please look at the hadrosaurian mummies. Take note of their limb proportions. Way thicker than Doug portrays them. If one has arm bones that are two inches in diameter (thick bones! ), but one draws the fleshed out arms as being an inch in diameter…same bones, same arm…where does that leave us? 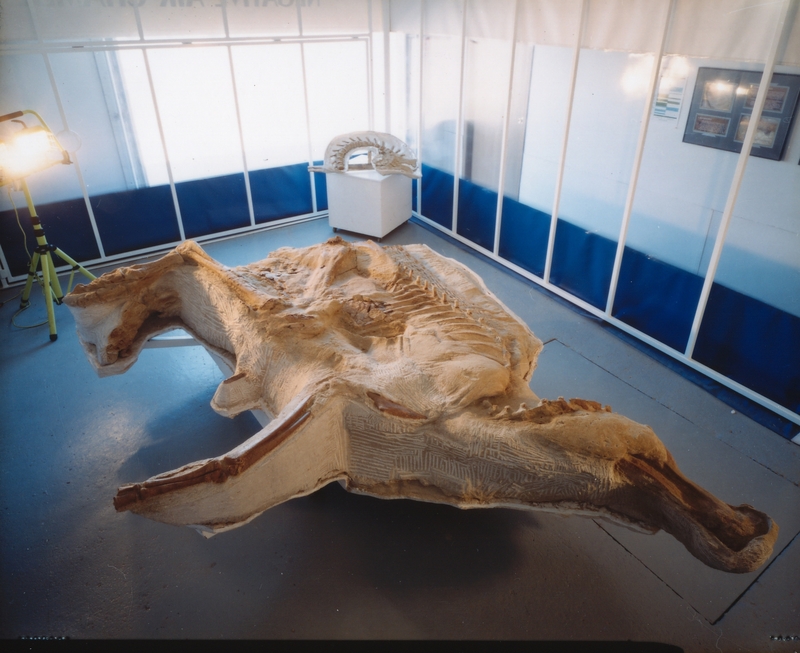 Are the paleoartists who insist on such thin limbs, ignoring muscle, blood vessels, fat, and skin, contending that the fleshy appurtenances shrink the bones while the animal was alive? Do said bones then enlarge after death, due to the fossilization process? Please explain. And I am not one who chides an artist, but I can’t draw or paint myself. I am not on the outside looking in, sir, I have drawn and painted MANY dinosaurs. 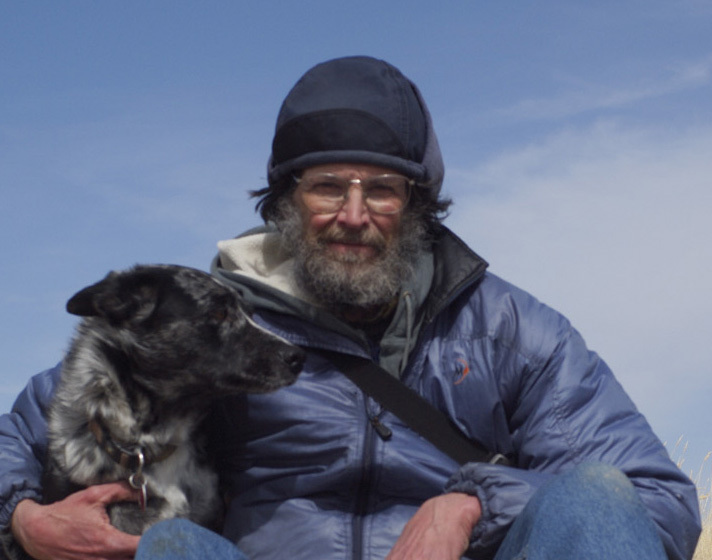 And Doug Henderson has always been a favorite; very inspiring to me for many years. I understand what you’re saying, but the proportions just don’t read so wrong to me. This rendering was done for the Leonardo mummy, and there are some good photos of its front limbs here: http://blog.hmns.org/wp-content/uploads/2008/09/leo-in-chamber-delin2.jpg and here: http://newblog.etee2k.net/wp-content/uploads/2011/03/EP2_P1023851.jpg and its tibia/fibula are particularly long and slender. I’d have to believe Doug worked from numerous high quality photos of the bones for this restoration. Maybe it’s me, but it doesn’t look that peculiar. Certainly very slender, but this was a gracile, immature animal. Thanks for the pics, Paul! I’ve seen pics of Leo before, and I do see where you’re coming from. Instead of beating around the bush, would you like to see my version of Leo, based on the mummy you’ve shown me? It’ll be next week before I can do it. Now that I’ve seen the actual fossil he based the painting on from that angle, I can for certain that the front limbs’ lower elements are at least half as thick as they should be, even if we just saran-wrapped the bones. Don’t worry, Doug’s still a favorite of mine. He, like the rest of us who draw dinosaurs have made mistakes. To me, a mistake is made when the restoration will not fit the skeleton. Velociraptors painted/drawn/sculpted without feathers before that tidbit about their integument was known does not count as a mistake. Making the legs twice as long as the bones indicate would be. Many modern restorations ignore skeletal realities. Tyrannosaurs with overlong, thin necks, ornithopods with out-of-joint, emaciated forelimbs, ceratopsians, especially Triceratops with forelimbs that would not fit on the bones and are undermuscled to boot, sauropods with almost horse slender limbs. There are more, but those will do for now. Do I myself think my dino art is perfect? Nope. But I DO try and work from what the bones and my knowledge of actual living animals shows me. Of course the arms might be too thin. But I based the reconstructions on some technical drawings (Greg Paul style, sorry, but the name of the artist escapes me) provided by the little museum in Malta when I swung by for a day visit. I saw the long, relatively thin limbs and even was shown the skin impressions of square-sided tubercles of various sizes appearing to be rather tightly draped over parts of the lower limbs–suggesting there wasn’t much meat to them. But that was just my impression–and so reflected in the finished pastel. The forever changing data and interpretations of old animals is what is driving me to want to just go draw glaciers. Any time an artist wanders into the unknown, mistakes will be made. I’ve made a few (thousands, is that a ‘few’?) mistakes myself. On dinosaurs. Mistakes don’t make a piece of work bad. Cold, impersonal technical drawings without ‘mistakes’ are worse for me than a lively piece of ART that makes me feel the world I’m seeing, even if it’s a pastel painting/drawing, whatever kind of work it is. The main reason I commented on the legs being too thin is this: I don’t think we give these creatures the credit they deserve many times. They were marvelous beasts, wonderful to behold and contemplate. Modern restorations very often, in my opinion, make them too thin; undermuscled. These creatures lived in a harsh, cruel world. Their bones often show scars from both predators and parasites. The artist you mentioned was in many ways a visionary, but he often makes his dinosaurs look positively emaciated, sometimes even making the leg-flesh too thin to fit around the bones. I see dinosaurs, in my mind, as living creatures, with lives to lead. I love seeing them represented as having enough muscular armament to get through those lives. I still stand by my statements, but I hope I haven’t offended you. That was the last thing on my mind. And just to make something clear: Doug’s pic of the Iguanodons and the Deinosuchus et al, have been favorite dino pieces of mine for years. They’ve been very inspirational and influential on my own art. I have not copied any dinosaurs from anyone, but this man’s art, along with Knight, Bakker, Burian, Matternes, Rey, Paul and a number of others pushes my own envelope out farther than it would ever have gone without them. Doug’s work especially is very atmospheric, very natural without being a slavish copy of some modern scene. His talent puts me IN these animals’ worlds, and for that, I salute him.